Freddy Krueger rises from the grave! Great for frightening people on Halloween! Statue measures 14 1/2-inches tall x 33 1/4-inches wide x 16-inches deep. Made of durable, water resistant, incredibly lifelike foam. And you thought A Nightmare on Elm Street was scary! What is THAT? The next time the in-laws come to town, imagine their reaction when they see this in the middle of the guestroom floor! Create the illusion of Freddy's head and arms crawling out of the floor or ground with the Nightmare on Elm Street Freddy Krueger Grave Walker Statue. 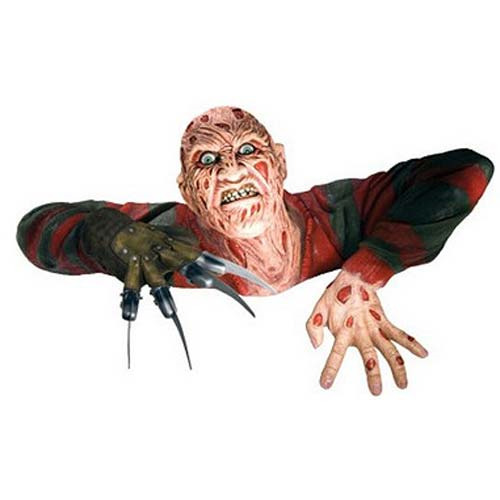 This fun and scary statue of Freddy Krueger measures 14 1/2-inches tall x 33 1/4-inches wide x 16-inches deep, and it's made of durable water-resistant foam that appears unpleasantly lifelike. If you're looking to scare a few unsuspecting neighborhood kids who've been giving you trouble, you could do a lot worse than this frightful Nightmare on Elm Street Freddy Krueger Grave Walker Statue! Ages 17 and up.